My oldest daughter, Emily, is a work of God’s goodness and grace unfolding before my eyes. Is she perfect? Well, of course she’s not. No one is-especially not a 9 year old little girl, but I see in her a “perfecting” work of God. He is transforming her into the image of Christ everyday. If that is as close to perfect as we will ever get, then I will surely take it!! The fact that she was even considering writing hers about Jesus was a great thing in my eyes. After that, I didn’t really hear anything more about the assignment. She did the bulk of it as a classroom project, so we didn’t see it until the day of the “student-led” teacher conferences. Emily’s school does one student led conference per year. Before the night of the conference, the students and teachers go over the agenda for the conference. One of the items of work she was set to present that night was her “Hero” paper. The papers of the whole class were all displayed on a section of the wall out in the hallway. Emily was nervous to read her paper to us, because it had to be read out loud to us while the teacher listened on from afar. 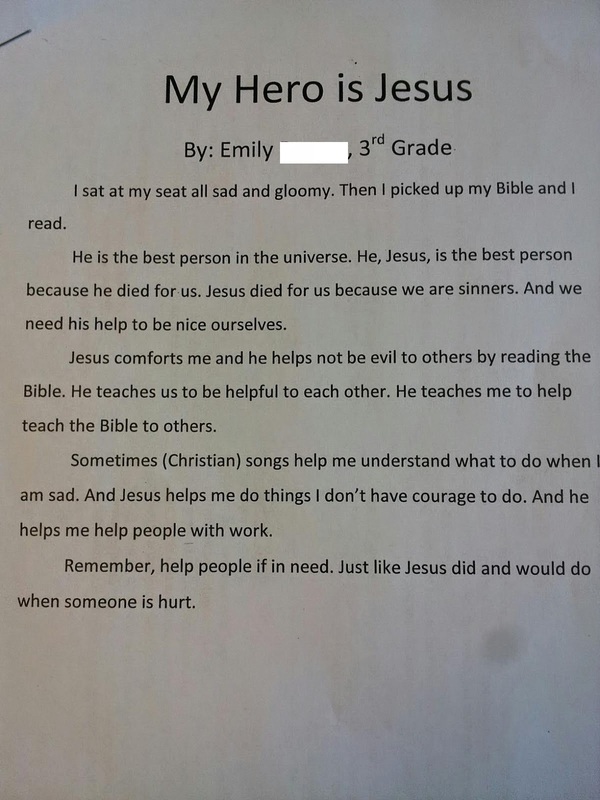 I was so amazed that she actually decided to write the paper about Jesus. By God’s grace, His message is getting through to her. One of the things that we try to teach our children is that the bible is God’s book, “His-story” as some put it. The problem is that we often see “HIS-story” told with the main character left out. God is the hero of every story in the Bible, and He is also the hero of this story called life. God designed it to be that way from the beginning. God told Noah that He was going to send rain and flood the earth. He told Noah to build an ark for all the people and animals to board in order to be saved from the flood. Noah obeyed God. Because Noah obeyed, people were saved. Isn’t Noah good? God told Noah that He was going to send rain and flood the earth. He told Noah to build an ark for all the people and animals to board in order to be saved from the flood. Noah obeyed God. God kept them safe on the ark, just as He had promised! Because God kept His promise, people were saved. Isn’t God good? So, WOW. We can’t even begin to fully understand Him! The understanding we do gain about Him is by His grace alone! “Who has been His counselor?” Yeah, so I know for sure I will never tell God anything that He doesn’t already know!! Chew on that for a minute! What about the phrase above that says “Or who has given a gift to Him that he might be repaid?” Meditate on that thought! And think, He lavished the greatest gift of Jesus upon sinful people that friendship with Him would be restored! I am thankful that God, by the death of His Son, Jesus, chose to do I transforming work in this little heart of mine! I am also thankful for the work I see Him doing in my 9 year old little girl. I am so glad that she sees Jesus as her hero. The fact that Jesus would come to earth as a man, suffer and die for sinful people, for me, makes Him the HERO of my life!! Now turn the question on yourself…Who is your hero?? That is AWESOME and I mean AWESOME. It's exciting to hear a child describe Jesus all on their own and hear that they have faith and to describe him as her HERO. Very refreshing!! !